LaBarberia Institute of Hair, the Cleveland Barber College, has been recognizing our students with a monthly spotlight for their talents, ambition, and hard work. During the month of November 2018, we would like to acknowledge Te’amo Quickley. Te’amo is originally from Dover, Ohio. Before coming to LaBarberia, he worked at a factory down south. 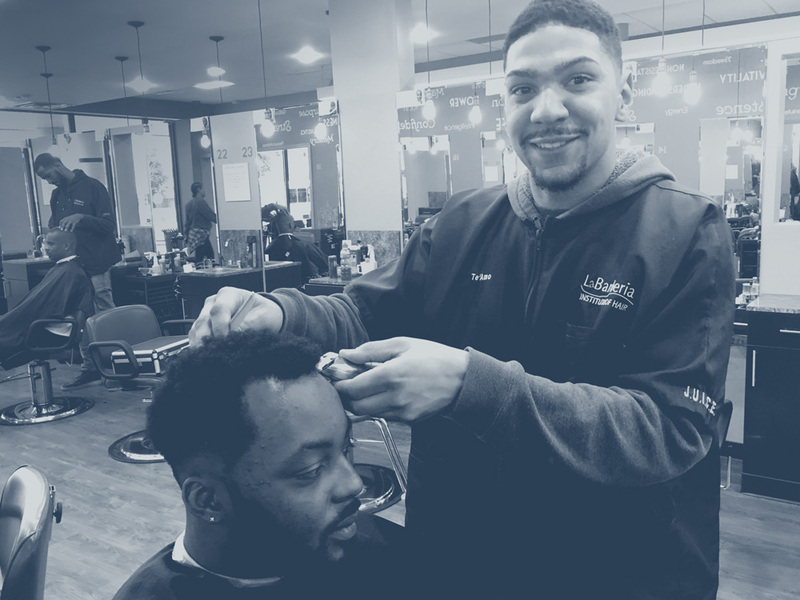 Once moving to Northern Ohio, Te’amo worked at an Applebee’s until he realized that he wanted to pursue a higher career path, a calling — barbering. Te’amo always knew he wanted to be a barber, he just didn’t know how or where to start. When he was younger, he would always cut his friends and his own hair. He knew it was something that interested him, just didn’t know how to pursue it as a career path. When searching of barber schools online, he came across LaBarberia. He applied, and received his call last February. Unlike other barbers who trademark different barber names, Te’amo thinks he’ll keep his given name as his brand. The word “te’amo” translates to “I love you” in Spanish. This ties him to his part-Dominican, part-African American heritage. His mother picked the name when she heard it on a Spanish television program. Te’amo is a fitting name. Te’amo is a loving father. He contributes all his hard work and dedication to having his daughter, “I’m doing it for her”, he states happily. Having his daughter was the motivation he needed to pursue his dreams. Te’amo currently has sophomore standing in the LaBarberia program. After graduating from LaBarberia, he plans on expanding his learning through working at a barbershop to gain more experience. His goal is to not only start his own barbershop, but start a large franchise of barbershops.